Art and painting has for a long time been a passion of mine. Many hobbies like theatre, painting and literature are great means for reducing emissions. We can combine economic growth and happiness without destroying the carrying capacity of the planet or our environment. Imagine if people would spend their money on theatre, books and an art class instead of meat and gasoline. 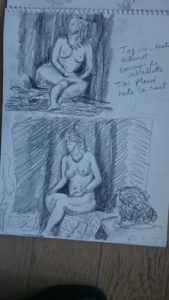 Actually I took up croquis (drawing models) recently after a long break. The first day was when we were living in Paris and this model had actually been in the Bataclan massacre the day before and she broke down crying in the break and told us about it. The school had offered her to skip work and stay at home but she said it was worse to be alone than work.